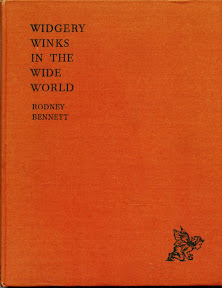 Not only was it the authentic book, it could have been the actual book I once owned. 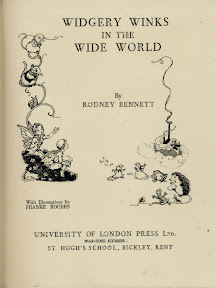 Highly unlikely, I know, but this copy was printed during the war as I discovered by noting that the war time address of the printer had moved out of London to St. Hugh's School at Bickley in Kent where it was printed in 1943. Clever girl. Thank you very much. Today is Saturday and we've been doing a little DIY. Mainly fixing big hooks in MYF's garden shed to hang tools on. We're not that brilliant at DIY ( at least I'm not!) but we did manage to put up a couple of wooden shelves in said shed. I think next week will be the time to start work on the garden. 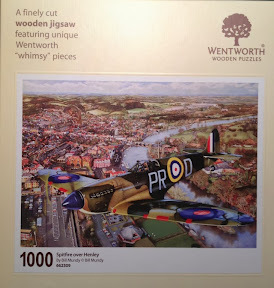 The Wentworth Wooden Jigsaw Company have just produced their latest puzzle. It's my painting called 'Spitfire over Henley'. The puzzle comes in a variety of sizes - starting with the 250 piece version. I've bought the 1,000 version. Should be a nice challenge. 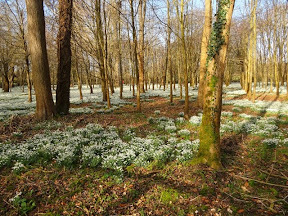 Last Sunday my young friend and I went over to Welford Park near Great Shefford. 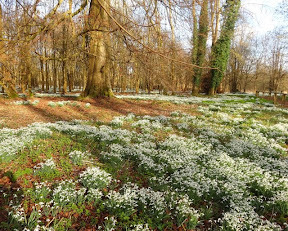 It's the best place in England to see snowdrops. And we weren't disappointed. 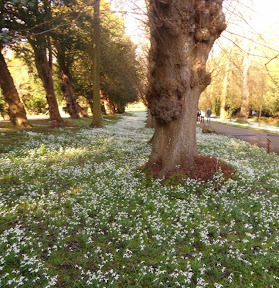 They were marvellous - in full bloom. 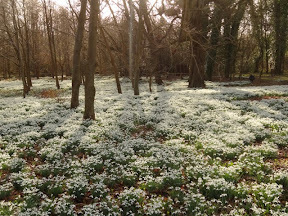 We took a leisurely walk around the estate. Here are a few photographs. Each Friday afternoon I drive over to Warborough for my sculpture lesson. Currently I'm working on the head of Brian Hill, a friend of mine. So far I've only had three sessions on this portrait so it's not worth showing you my progress at this time. 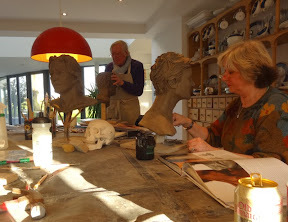 But this is the venue at Shirley Collen's house where you can see Tom and his wife Eleanor who are both working on lovely heads of their children. Incidentally Shirley is inviting anyone interested in joining our class to contact her. I can put you in touch with her if you'd like. Yesterday, Val, my young friend and I, drove over to Bampton to have lunch with our friend Joanne. (Our first turkey Christmas dinner of the year - and delicious as always). 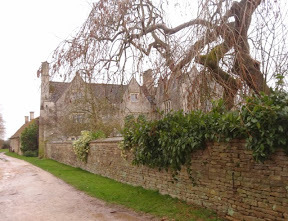 We hoped to visit Kelmscott Manor - not far from Bampton - but it was a really miserable rainy day. And it was closed anyway. Shame - we'll go back when it's open. Kelmscott Manor was built around 1570 and was the home of William Morris - the famous artist, textile designer and prominent socialist. 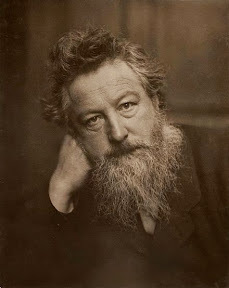 He was associated with the Pre-Raphaelite Brotherhood and loved his house, calling it his "heaven on earth". 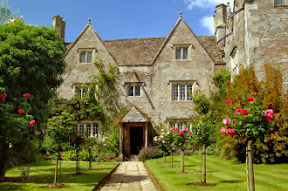 Here's a photograph of Kelmscott Manor (on a lovely summer day) - and how we hope to see it next time we go there. Last week BBC Berkshire were doing a programme about Huntley and Palmers biscuit factory and when they discovered I served a 5-year apprenticeship there in the fifties as a lithographic artist, they rang and asked me if I'd be interviewed about my experiences as a biscuit tin and tea caddie designer. Which I did, with Anne Diamond doing the interview. On Saturday I called in to see my good friends, Alwen and Rolf. They were celebrating their 56th wedding anniversary. Such a loving couple. Many congratulations to both of you.